Here's an article about our house that was recently in the newspaper. It didn't take Chris Forney long to change his mind about plans for the house he bought atop Spring Hill. In 1989, he bought the $38,000 house with the intention of cleaning up "the wreck" and reselling it. The results of his initial work led him to change his mind. 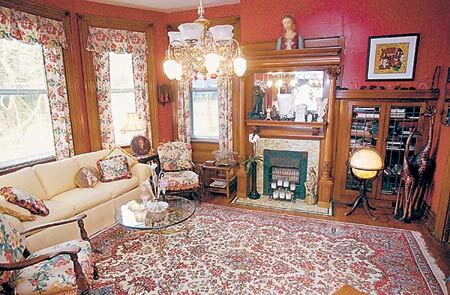 An antique ceiling fixture hangs from the center of the front parlor of Chris Forney and Carolyn Thornton's home along Rhine Street on the North Side. "A month," he says of the speed of his decision to stay in the house. "It didn't take long to see what was here." What he found was a Queen Anne-styled house from 1897, full of the kind of features that make the genre a delight: ornate wooden mantles fronting gas fireplaces; rich woodwork and sliding pocket doors; stained-glass windows; and rooms that breathe under 11-foot ceilings. The Queen Anne-styled house from 1897 features things that make the genre a delight: rich woodwork, stained-glass windows and rooms that breathe under 11-foot ceilings. The house now is home to Forney and his wife, interior designer Carolyn Thornton. The couple have come to enjoy its nearness to Downtown, but also revel in the quiet, an asset of its elevated placement. "When you buy a house like this," Thornton says, "you don't end up doing it because you want to sell it. You do it because you end up loving it." One of the aspects of that love, she says, is the neighborhood, a mix of people who have been there for generations and others who are recent enthusiasts about the area. "You meet people when you're out walking the dog," she says, "and you come to realize we're all here for the same reason." For Forney and Thornton, part of the reason is the house, which sits near the peak of Spring Hill. 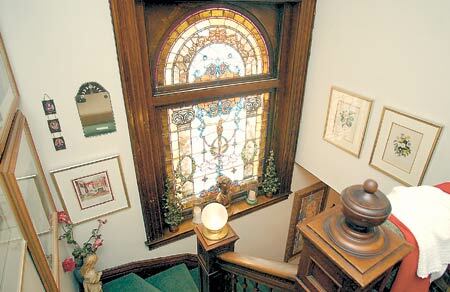 It overlooks Spring Garden valley and has a view that overlooks the northeast. The property covers about a third of an acre. It has enough green that deer sometimes visit. He built a waterfall in 2001, and the yard has qualified as a Backyard Wildlife Habitat by the National Wildlife Federation. The recognition is given to a home that provides space, landscape and an environment friendly for animal visits. 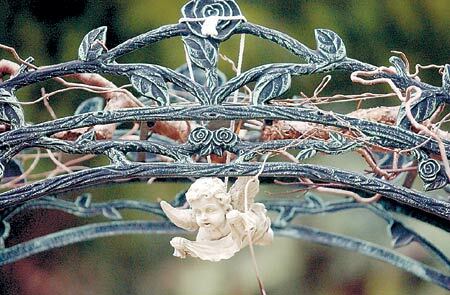 A cherub watches over the garden of the Forney-Thornton home. Forney, who works for the Pittsburgh Partnership job-training program run by the City of Pittsburgh, points enthusiastically at some of his favorite features of the home. Chandeliers are wired for electricity but still have workable gas lines to provide a Victorian look. "And I think if I have counted correctly, it has 63 windows," Forney says. The rooms vary greatly in size, but provide enough variety to take on new roles. For example, one the smallest of the five bedrooms has become a walk-in closet. The first floor is the object of most of the design work. Only one of the bedrooms on the second floor is used for that purpose, the rest having given way to office space, Thornton's closet and a family room. 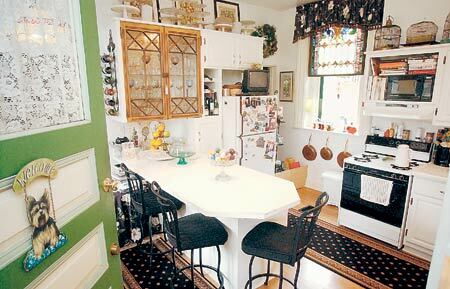 The kitchen at Carolyn Thornton and Chris Forney's house features a stained-glass window. The property covers about a third of an acre. It has enough green that deer sometimes visit. Forney, a Pittsburgh native, says he didn't know about the Spring Hill area when he moved back to town from Evansville, Ind. He liked the home as soon as he saw it and eagerly accepted the challenge to fix it up. He says doesn't know how much he and his wife have spent on the house, because they did much of the work themselves in an ongoing process. It was Forney's first time to tackle this sort of project -- which was also his first home purchase -- but he was familiar with similar work from activities such as building furniture. "I wouldn't advise this to someone who hasn't done this type of work before," he says. He points out that his wife's skills came greatly into play when she joined him from Evansville in 1992. "I always joke that I married an interior decorator because I needed some work done," he says. 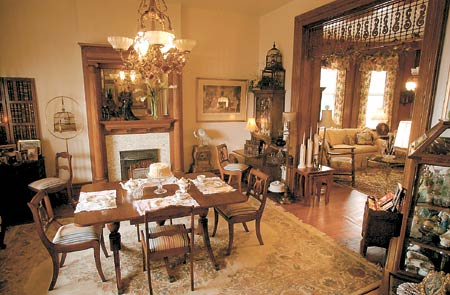 While some of the features of the interior are her doing, Thornton points out that Forney has made some "great" moves, such as buying the epergne in the living room. "He has a soul," she says. "I love that in him." Part of that soul also has emerged in a custom framing business Forney runs from the home, sometimes playing a part in Thornton's design work. The home is filled with furniture that reflects its Victorian heritage, as well as knickknacks that show off the couple's collections of cake plates, perfume bottles and birdcages. Hardwood floors have been refinished and topped with a range of rugs. But there's enough bare wood around to give sound to the scrambling of their 9-month-old Shiatsu, Suki, and 6-year old Yorkshire, Pooki. Overall, the home's walls tend to be white or off-shade, but the living room boasts a rich red. Thornton says she believes a room in the center of the home can have that deep color as the heart of the house. A collection of souvenirs from world travels decorate the sitting room. Getting it there wasn't easy, they both admit, talking of working hard to get the walls to be just the shade they envisioned. It's one of the few rooms in the house where they had an idea they wanted to create. The rest came together because of furniture, rugs and accessories that were available at the time. Forney laughs when he discusses that, saying such a haphazard approach violates the manner Thornton usually takes on a site. But she says the development of their Spring Hill residence is simply realistic. "Life just happens," she says.